Distant view of 'Taj' from the river Jumna, Agra. bl.uk > Online Gallery Home	> Online exhibitions	> Asia, Pacific and Africa Collections	> Distant view of 'Taj' from the river Jumna, Agra. 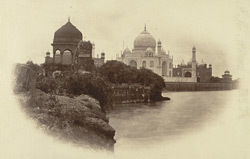 Photograph with a distant view of the Taj Mahal, Agra, taken by an unknown photographer in the 1870s, part of the Bellew Collection of Architectural Views. From 1526 when Babur defeated Ibrahim Lodi, the Afghan ruler of Delhi, and ensconced himself in Agra, till 1638 when his great-great-great grandson Shah Jahan built a new capital city at Delhi, Agra was a repository of Mughal wealth and power. The iconic Taj Mahal, universal symbol of beauty, love and loss is the culmination of the pursuit of magnificence in the Mughal style of architecture. It was built by Shah Jahan (ruled 1628-58) as a tomb for his favourite wife Arjumand Banu Begum. His beloved companion and confidante, she died in Khandesh in 1631 giving birth to her 14th child, while accompanying him on a military campaign. The building's name is an abbreviated version of her title: Mumtaz-i-Mahal or Chosen of the Palace. Built of white marble inlaid with precious and semi-precious stones, the mausoleum is square in plan and surmounted by a bulbous dome. It stands on a plinth with a minaret at each of the four corners and is set at the northern end of a walled garden complex of the traditional char-bagh (four-plot) plan.